Let’s just start with who you are and what Spincult is. My name is Victoria Elizabeth Young and I am a native Memphian. I am the owner of Spin cult. Spincult is a place that we fuel you to fuel the world. You know we are located in the Medical District right so the irony of it is all is that the people that we are interacting with are like literally saving lives. They are either practicing medicine or what you – some health profession and they have to deal with everyone else’s cares and concerns and so we just wanted to be an oasis that focuses on holistic health to make sure you are taking care of yourself, spirit, soul body, so you can go take care of whomever you are serving. Selfishly I began looking at this area because I started hanging down here a lot after I came from college. I am all about the underdog start up grind and I saw all the development that was happening in the medical district so when I came back from graduate school or even since I was in law school I did the small developer incremental meet-ups you know the small developer boot camps with the medical district. 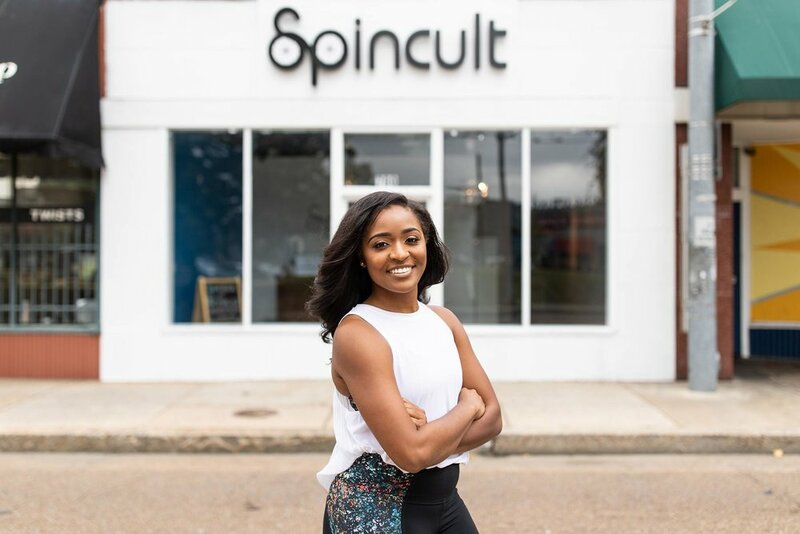 I have been going to those as part of the cohort and I was like a lot of people believe in this area and revitalizing these spaces and if I can bring something that can align with that mission then I would go after it full throttle and so yeah that is how Spincult came down to this area. Also, the Medical District had great incentives and resources for startups for people who would not walk into a bank and ask for a big bank loan. I can really say the pre-development grant and the sign incentive for Spincult – you know I wouldn’t have been as motivated to do that. The support really made the difference for my first brick and mortar and having those really set the tone and kind of let you know that there are people who have vision for the community and so just to be mission aligned with them is also why I chose the medical district. Where did the idea come to start a spin business? So I went to undergrad in North Carolina, and I was a cheerleader in high school but we didn’t do anything but run for conditioning so I kind of like eeny meeny miny moed on my fitness schedule in college. I went to a spin class and loved the fitness and energy and was like man these people are crazy but I have never sweat like this in my life so in grad school in Los Angeles of course it was like every corner had a specialty fitness options and they had a lot of nice studios that have their own vibes and these beautiful spaces with beautiful spirits so if I can emulate that where I am I have to do it for myself because if I want it other people want it and I knew Memphis has a drive now for these transplants and creating jobs. You know like you the medical district, obviously UT is a very reputable health science school and like who wants to go to a big box gym. That doesn’t make sense for a student’s schedule you know. So that perspective of wanting to have a place that I could kill it really quickly and then go about my day. Any specials or other information? You can always check the website. Spincult901.com and it will always have the schedule there and the pricing is there. You can get memberships, class packs, and drop in class prices. We have student memberships where students can pay $100/month for unlimited rides. We also have the Medical District employee discount so if you are an employee at any of the institutions or in the medical district you get the $110 dollar rate. It is a good deal because our drop in rate is $20 so if you are coming in 5 times a month you have already hit 120 dollars so that membership is really a deal. I mean if you think about what you spend on coffee or just junk and yeah that $110 is a great investment. We are going to run the grand opening $110 special for a bit longer. I don’t know I am just excited about what this area is going to become. You know thinking about what the edge District was a year ago vs. what it is now it is beaming with so much promise. It is going to be that live work play they keep echoing. I mean I am excited I think it is great leadership and community organizations are just starting to talk to each other and make a comprehensive plan that makes sense in the larger framework of development and renewal so you know I am just happy.